Written and produced by Julie Dash in 1992, Daughters of the Dust was the first African American woman’s feature film to achieve widespread distribution. 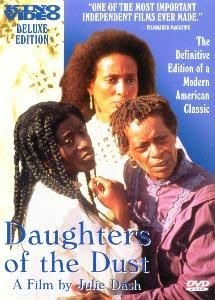 In stark contrast to most Hollywood films, Daughters celebrates the physical diversity of black women, their many skin tones and hair textures, while also speaking into the silence of black women’s historical experiences of slavery and continued sexual exploitation. Daughters of the Dust was one of the first films I encountered where I was both the subject (rather than a marginalized, silenced, or objectified “other”) and the intended audience. That move from margin to center was empowering for me, as it was for so many other black female viewers, who were desperate to see a film that did not violate or exploit the black female body but instead bore witness to the pleasure and pain of being black and female in America. Tisha Brooks is a professor of American and African American literature at SIUE. The above reflection appears as part of an exhibit concentrating on productions and artifacts that first inspired encounters with feminism. The exhibit was coordinated by the Women's Studies program at SIUE.